The Living Façade is one of EEA's main contributions to the United Nations International Year of Biodiversity. 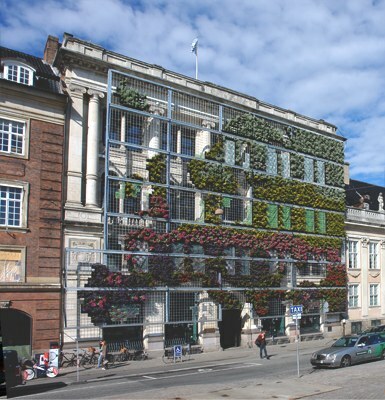 The front of our building on Kongens Nytorv 6 is covered with about 5,000 annual plants showing a map of Europe and plant biodiversity. The façade will stay in place from 22 May to October 2010. Follow the project step by step, and learn more about the science behind it. The EEA Living Façade wants to illustrate the significance of vertical gardens as urban green areas. These areas represent a backbone for human health, biodiversity and ecosystem services in cities. For most urban dwellers, the perception of "greenery" in or nearby their cities is an integral part of what constitutes the 'quality of life'. Indeed urban green can improve air quality and noise conditions. Despite being highly artificial, urban areas can, by intelligent design, offer additional habitats, maintaining ecosystem services and thus limit the ecological footprint of cities. This ambitious project is the first outdoor green façade in Denmark. It is made possible by intensive co-operation between architect Johanna Roßbach, LIFE - Faculty of Life Sciences - University of Copenhagen, the municipality of Copenhagen, engineers from Ramboll Denmark and Green Fortune, a company specialised in the construction of green walls. World Biodiversity Day 22 May: In conjunction with the façade's inauguration on 22 May, EEA hosted a seminar, 'Citizens meet Science' focusing on the importance of citizen involvement in preserving biodiversity. The EEA also hosted the photo exhibition 'Living Green' by Mattias Klum – a photographer for National Geographic. Exhibition “Biodiversity is life, Biodiversity is our life”: in close collaboration with the French Embassy to Denmark, Global Biodiversity Information Facility (GBIF), EEA co-organised an exhibition, designed to inform a wide range of audiences about biodiversity and its importance to us. The exhibition consists of 18 posters selected from the UNESCO travel exhibition. The exhibition will be hosted at the Botanical Museum, in Copenhagen, from September 7th to October 24th. Copenhagen Culture Night 2010 (Kulturnatten): Along with many other public institutions and cultural attractions in Copenhagen, EEA will open its doors to the public on 15 October 2010 and host a series of activities on its premises. This year's EEA program will focus on biodiversity and quality of life in cities. Our Living Façade, re-vamped with a light installation for the occasion, will be at the heart of the event. Become a "facebook friend" of the EEA Living Façade and invite your family and friends: EEA living façade facebook group. For references, please go to https://www.eea.europa.eu/themes/biodiversity/living-facade/living-facade or scan the QR code.